Nikon has added a new compact system camera to its Nikon 1 family, just one month after announcing the Nikon V3. The Nikon 1 J4 comes nearly a year after the J3 was launched and features the same improved Hybrid AF system as the V3, which has 171 contrast detect and 105 phase-detect points that is said to help lock onto subjects super quickly. Again like the V3, it has the capability to shoot at up to 20fps with continuous autofocus and up to 60fps with the autofocus fixed, all with the help of the Expeed 4a processing engine. The J4 drops the viewfinder - as did the V3 - while whole unit measures at 99.5 x 60 x 28.5mm and weighs 232g. Similarities to the V3 don't end there, with the J4 touting the same 18.4 million pixel sensor with light sensitivity range of ISO 160 - 12800. But while the 7.5cm touchscreen doesn't tilt as it does on the V3, the J4 also has a 1,037k dot LCD touchscreen, as well as built in Wi-Fi for quick and simple image transferring. The Creative Palette feature found on the V3 appears on the J4 as well, which allows you to view different effects before you take the shot. Of course, Full HD video recording is available - just like the V3. 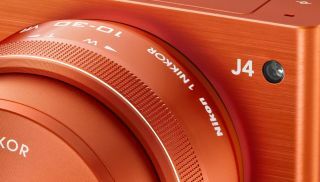 The J4 will be available from May 15, and while pricing has yet to be announced, it is likely to have a price tag more friendlier than the V3.